Megan Newbanks! Congratulations to Megan for being picked as the winner in the Anne Boleyn Files Anne Boleyn Portrait Giveaway. 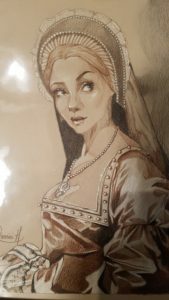 Megan wins GeminiArt’s lovely portrait of our favourite historical heroine, Queen Anne Boleyn. Huge congratulations to her! Thank you to everyone who entered and to everyone who follows my work. I’m finding it hard keeping on top of everything at the moment and I’m so sorry that I’m not able to answer everyone’s comments, questions, emails etc. but there are only so many hours in the day and I’m working hard on research, writing, recording videos, working on the Tudor Society, and doing my “Questions about Anne Boleyn” series, plus a lot more! Phew! I am so very appreciative of all your support, though. « Was Anne Boleyn charged with witchcraft? Congratulations, Megan, a lovely portrait. It’s very pretty and it’s similar to the type of art that was around in the early seventies, they were very fashionable and they featured pictures of young women and girls quite fey looking with big saucer like eyes.